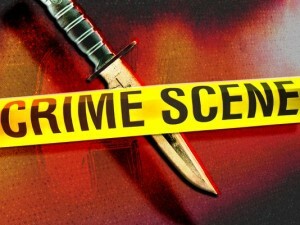 An attacker stabbed a 23-year-old man in San Luis Obispo early Saturday morning near the Denny’s restaurant on Madonna Road. The victim survived the attack, but the suspect remains on the loose. Shortly before 3 a.m., a young Hispanic man allegedly stabbed a 23-year-old multiple times. Friends of the victim transported him to a local hospital where he received treatment for non-life threatening injuries. The victim, who told officers he did not know his attacker, has since been released from the hospital. The suspect is described as an Hispanic male in his early 20s, 5 feet 8 inches to 5 feet 10 inches tall with a medium build and black hair. He was wearing all black clothing, including a black jacket. Inspectors said they do not know the motive for the stabbing, though they believe it was not robbery. Investigators request that anyone who has information about the stabbing call the police department at 805-781-7312 or Crime Stoppers at 805-549-STOP. Do we just assume the victim was white? The racist’s do, look at the key words they use. Normally the media does not identify victims, for a variety of reasons. The identity of the victim is irrelevant and not news worthy, and it is not released to protect the innocent victims from reprisals and violations of their privacy. The identity of the perp, however, is extremely newsworthy and helpful, especially because he is still at large. Hell’s little green acres (slo) is turning into quite the little shathole isn’t it? Santa Maria north coming our way. It SURE IS! I have thought that for quite some time. Last time we heard of this–was only weeks ago and it was a guy who stabbed someone–left them for dead and carjacked their truck. It will get worse…so people might as well say goodbye to this charming and safe little haven. I watched a Hispanic woman with 4 kids here in SLO the other day just pounding on a child that looked to be about 3. She then left him on the sidewalk and walked off while he screamed in horror. I could see trauma unfolding before my eyes–poor kid. This came just days after a Hispanic man had literally bloodied the nose of his 8 year old downtown in front of dozens of people and did not let up until the police showed up. It is sad. A perfect example of why anyone that wants to – should be able to pack a little heat! Possibly a gang initiation. That’s the way they roll in LA. I worked with guys when I was younger that “initiated in” when they were like 12 & 13 years old. Soon….the body count will go up. That is the way it happens….then you have White Flight. More people will move out of SLO to suburban houses….and this city will become trash. What? Body Count, White Flight from your examples above “a Hispanic woman with 4 kids””a Hispanic man had literally bloodied the nose” ? “move out of SLO to suburban houses” Wtf there are no Suburbs in Slo county. Share your bretbart talking points with your friends? Stop spreading your FUD. I was going to write something funny.. But ultimately can’t think of anything. Madonna Road, between Oceanaire and South Higuera is getting pretty bad. They need one police officer stationed in that area. There also needs to be one police officer or more assigned to constantly drive or walk around our cities parks. A lot of homeless activity takes place near/around Ralphs.. there is an encampment for the heavy drinkers in the bushes there near the highway offramp.. They need to take care of that, as it is creating a lot of fighting and crime in the area.. Not to mention garbage littered everywhere. I completely agree – BUT it’s not a tourist area, not an historic area, not near a college, not downtown, not trendy, ergo it is not important to the city. So don’t hold your breath on this one and be sure to lock the car! It was always weird to me that Madonna Plaza and Madonna Inn didn’t try and discourage panhandling/overnight parking etc. in their parking lots and in that area in general. Feel like the Madonnas kind of brought this one themselves by not being more strict. Right because if it is on Madonna Road it must be Alex’s fault. They allowed long-term RV parking on their property, and very visible panhandling on their property. Once they allowed their parking lot to become an RV park, full of career panhandlers.. you know, the people a few years back who started panhandling 12-16 hours a day taking shifts near Panera/Chipotle, and near Ralphs? The Madonnas could have put a nix on that, but they didn’t, now their entire development on Madonna road is kind of turning ghetto and has a reputation amongst the homeless as a great place to panhandle all day with nice grass and as many burritos as you can eat. Combine that with lax policing of Laguna Lake park, proximity to the encampment behind Target, and being close to Prado.. But it mostly the Madonnas allowing a lot of panhandling on their property which started it. It is a Tourist area with hotels and everything, You are not a womanwhohasbeenthere or you would have seen that.